Oh hello, friends! Remember our Tristyle challenge for January? We asked you to show us how you style your favorite Jordandene clothing! Thanks to everyone who participated with us this month. :) I loved seeing you embrace your nerdy side. Amy at Taking Steps Home rocked her Jordandene style shoot by showing us two completely wonderful different outfits with her "mischief managed" tank. Take a look! Very creative and fun! Beth, Sam, and I have loved this TriStyle community, and we are super excited to see what 2015 will hold for TriStyle & Co. I hope you'll join us on the adventure! We will be working in every day items to our monthly style posts as well as still featuring fun brands for you all to try! Come back next week for our February challenge! XOXO. Labels: jordandene, style, TriStyle & Co. I can't wait to see February's challenge! I just got a shirt from Jordandene and will still be sharing it when it arrives. I've been super inspired by what everyone else has shared! 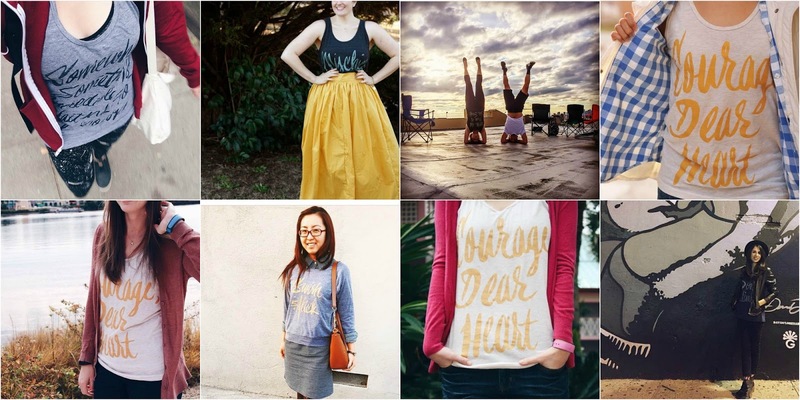 i love seeing how everyone styled the tanks and how each person's point of view is different! I loved this challenge so much! It was so fun seeing everyone get involved! Ha! My thoughts exactly. Loved letting my inner nerd shine. Oh hooray!! She has some really fun items!